I love the Sunday GROWERS GREEN FARMERS MARKET as much as I love Fremantle. It is a true community market with great atmosphere where Freo people meet friends and family, while shopping for fresh fruit and vegetables, bread, etc. It was packed full with families today. It was amazing how many babies had the brilliant idea of taken dad out for Father’s Day to the Growers Green. I only wanted to stay for an hour, but that became two hours because I bumped into so many people. Had a long chat with the owner of the Fremantle Herald Andrew Smith, talked my birth lingo with Dutch friends from Treacle Treat and the Duyfken, said hello to Minister Simone McGurk and Councillor Hannah Fitzhardinge and election candidate Kathy Anketell, The Fib’s Robby Lang was there, as was architect Tobias Bush, and of course market manager Kylie Wheatley. The GGFM is open every Sunday from 8 am till noon at Annie Street in Beaconsfield and raises funds for the South Fremantle Senior High School, so make the trip next Sunday! CONGRATULATIONS to the GROWERS GREEN Farmers Market team who were last night awarded one of the Fremantle Business Awards! The GG is my very favourite market that is all about community and raising money for the South Fremantle Senior High School. It sells great fresh and a lot of organic produce, fantastic bread, pastry, and the food stalls sell yummy breakfast. The Growers Green is at Lefroy Road and open every Sunday from 8 am till midday. SEE YOU ALL AT THE GROWERS GREEN ON SUNDAY! The best hangover cure after the disappointing Fremantle Dockers finals loss to Hawthorn is a Sunday morning with the community at the delightful GROWERS GREEN FARMERS MARKET. Besides great fresh fruit and vegetables and the great atmosphere you’ll also have the chance to meet some of your candidates for the Fremantle Council election. In between shopping, drinking coffee and having breaky wander over to my ROEL FOR FREO! stall and say G’day. I hear East Ward Councillor Ingrid Waltham will also be there, and the last two weekends I noticed Hilton candidate Sam Donovan and South Ward candidate Andrew Luobikis there, so catch up with any of us and tell us what changes you would like to see at Council. I think I might also have glimpsed South Ward Councillor Jon Strachan last week, unless he has a double. See you all at the GG this Sunday! Comments Off on SEE YOU ALL AT THE GROWERS GREEN ON SUNDAY! The absolutely lovely and very Freo GROWERS GREEN FARMERS MARKET is on again this Sunday from 8 am till midday so join the Fremantle community for a relaxing family morning and buy some fresh produce and great food. There will be live music, Damian’s animal touch farm, face painting and Fairy Sandie, lots and lots of yummy breakfast and coffee, etc. It’s just a great place to hang out on a Sunday morning and catch up with friends, network a bit, see some amazing dogs and just chill. I love it and will be there of course! Written an authorised by Roel Loopers. 5 Maxwell Stree. Beaconsfield 6162. 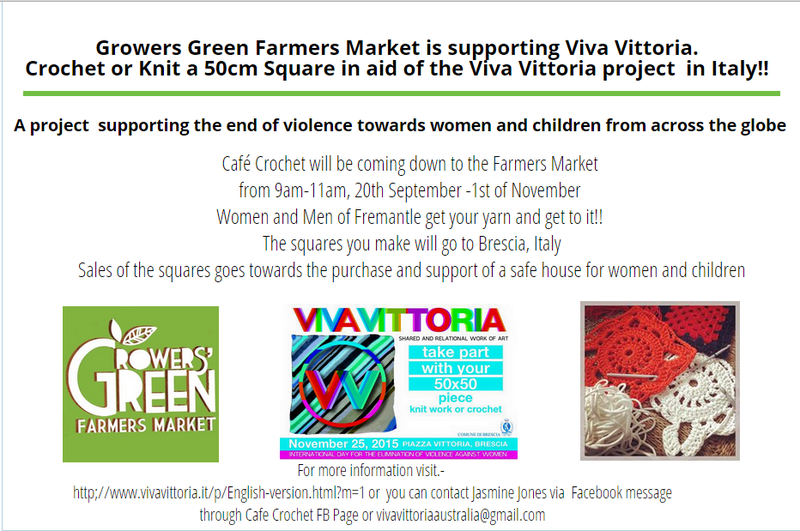 The Italian VIVA VITTORIA project to stop violence against women and children worldwide is a very important one and it is great to see the Fremantle GROWERS GREEN FARMERS MARKET supporting it. Women and men are getting together to crocket small squares that will be sent to Italy and assembled. Come to Growers Green this Sunday and every Sunday till November 1 from 9-11 am and catch up, have a offee, a chat and crochet some colourful squares. Domestic violence is an abhorrent and increasing crime around the world that needs to be stopped! Bring your bike along to the Markets on Lefroy Rd & have it judged by a panel of cyclists- Brad Pettitt- Mayor of Fremantle, Shani Graham – Ecoburia & Steve Grant –Fremantle Herald. Share your creative talent and have a chance to win great prizes generously donated by Mercer Cycles, South Beach Cycles and La Paleta. Arrive at 9am with your bike and entry form. Judging will take place at 10am. Entry forms available on the Growers Green website, in the Herald or on the day.